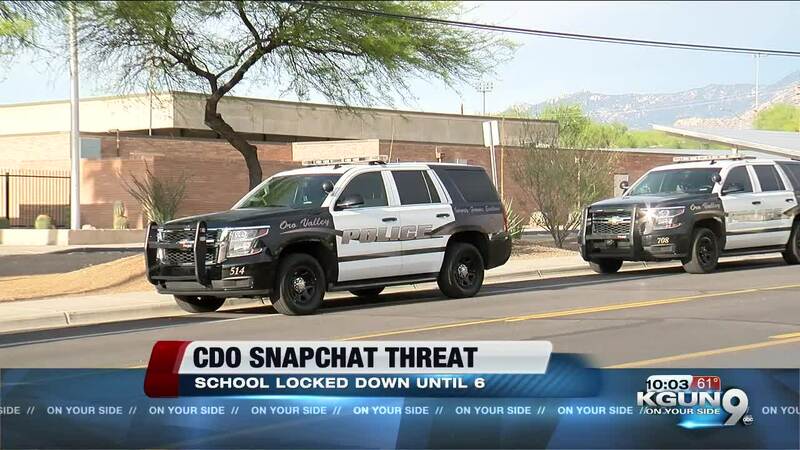 TUCSON, Ariz. — Oro Valley Police arrested a 15-year-old who allegedly brought a gun to Canyon del Oro High School Thursday, sparking a lockdown. Police arrested the teen at 1 p.m. Friday. He faces charges of reckless display of a firearm, possession of a deadly weapon on school grounds, minor prohibited from carrying a firearm and interference or disruption of an educational facility. Police say school officials reported that a student flashed a gun on campus in the 2 p.m. hour Thursday. Officers say they first heard about the incident from school administrators at around 3:30 p.m. Thursday. The report said a student had flashed a gun on campus. The reporting student didn't know where the suspect was. Police say most students had left for the day, but initiated a lockdown for the remaining families and students at the school. After a search, police couldn't find the suspect. Later, investigators learned the incident originated on the social media app Snapchat, where someone captured a video of the suspect in the school parking lot flashing a gun in his waistband. The suspect didn't make a direct threat in the video. They lifted the lockdown just before 7 p.m. Thursday.